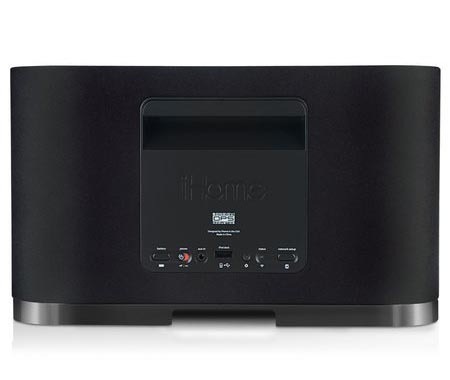 iHome’s new iW1 speaker will change your life and the way you listen to music. Soon all speakers will be this versatile. For now, purchasers need relatively deep pockets and a modest grasp of technology to set up and use iW1 to its maximum capabilities. A thorough written manual is included that makes the process relatively straightforward. A dedicated and full-featured web site for this product and its technology is here, including FAQs and how-to video. Web-based and telephone tech support are available too. Included is a powered oval charger base unit. Once iW1 is fully charged and the red front grille LED stops glowing, the speaker can be lifted off the charging bass. Carry iW1 by a handy grab recess in the upper rear of the case, and put away the charger until it is needed again, as indicated by sixteen white LEDs on the black top deck. Download and install a tiny custom free iOS iHome Connect app for your iPhone, iPad, or recent iPod touch, for AirPlay wireless audio transmission. Each audio app, such as iTunes, Pandora, or MOG, then has a small AirPlay icon that links the iOS device wirelessly to iW1 in a couple of seconds. There is no loss of audio quality with AirPlay, unlike Bluetooth audio transmission that reduces the volume of the stream. Wired iOS device playback is possible with an included 30-pin Apple dock connector cable that inserts into a USB port on the rear of iW1. An AUX input allows all external audio equipment to play wired through iW1. No cable is provided for AUX devices, but these cables are inexpensive and are easy to obtain. The included remote control unit is fully-functional for AirPlay and 30-pin playback, but only adjusts volume and iHome equalizer settings when in AUX mode. More later about this remote. The Apple Remote iOS app can also control iTunes for iW1, but I did not test that app for this review. MyMac plans to try the Apple Remote app and the iHome+Sleep free alarm clock app at a later time. iHome recommends you turn off the software equalizer (EQ) on your iOS hardware and use iW1’s native Bongiovi DPS custom sound, which is turned on/off from the remote. Users then can up/down iW1’s treble and bass to desired preferences. In MyMac’s extensive real world testing, Bongiovi DPS is much better on than off, and iW1’s treble and bass settings are easy to set and forget for most listeners. Maximum volume on iW1 is loud, without distortion, but not wall-shaking loud. Sixteen volume levels are possible, using the top deck multipurpose white LEDs. Some audio settings can be made by touching other white LEDs on this upper deck, but most of the time the remote control unit will be your best friend, with its full complement of controls. iW1 can also stream wirelessly from a Mac. Be aware that all iOS and computer WiFi network connections take about a minute to link, and that there are some built-in delays when turning on iW1 from a full shutoff. Detailed instructions are given in the included Start Guide, and on the product’s dedicated web site video. Extra kudos to iHome Audio for detailed user instructions in multiple media, setting a high standard for their competitors. The video is especially top-quality. Purchasers are not getting $300 speakers and sophisticated technology for free when they buy iHome’s iW1. The speakers are good to very good, but are not great. 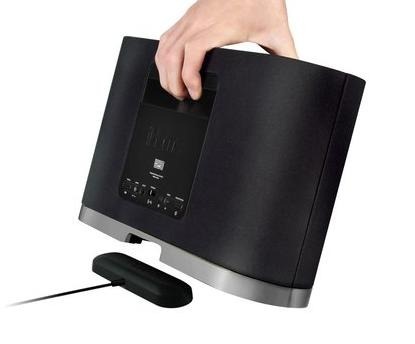 The combination of very good sound plus wireless flexibility is what gives this product its state of the art value. It’s a first generation breakthrough WiFi speaker system, so watch prices come down and quality go up during the expansion period of the next few years until this technology becomes mature and commonplace. If you never bothered to program your VCR, you are possibly too technologically challenged to get iW1 up and running wirelessly. There are some aspects to the process that are a little confusing, so be patient, and wireless music will be your reward. The mid-quality speakers within iW1’s gorgeous enclosure sound best at a distance, or outdoors. I sat outside for several hours last Sunday, playing my guitar along with a hundred or so different rock, pop, blues, jazz, and classical tracks from my iPod to iW1. The sonic experience on my outdoor patio was splendid, especially at louder volume levels that got my wife dancing while she was gardening among the cacti. “How does it sound?” I asked, as I changed EQ settings? “Great, John, so stop asking me!” she said more than once. Allow up to 30 hours for full speaker break-in. The iHome Rz10 remote control unit is a winner. Round press-blob buttons include: power on/off, WiFi, iPod, play/pause, volume up, volume down, forward track, previous track, mute, shuffle, repeat, Bongiovi on/off, bass up, bass down, treble up, treble down, and reset. Response is immediate. The remote is black with gray-white icons, meaning it is easy to use in bright light but difficult in low light or darkness. For $300 iHome should provide an illuminated remote. 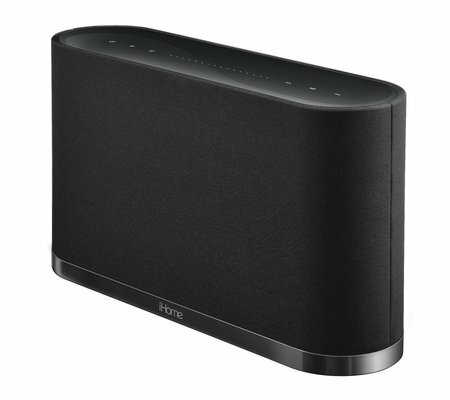 MyMac congratulates iHome Audio on this first product in their new Air Series. We are excited to test all that follow. Our two suggestions to improve the user experience are easier WiFi setup with quicker initial linking, and an illuminated remote control unit.